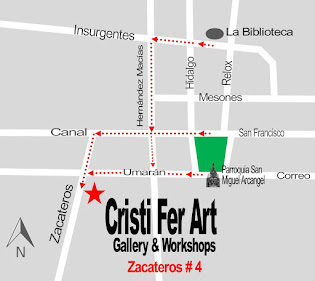 Cristi Fer Art Gallery and Workshops, in San Miguel de Allende, Mexico: Who are the instructors? Mayan, Aztec and Mexican history. With over 30 years of painting and 25 years of leading engaging art instruction and sharing his vast knowledge of Mexican art. 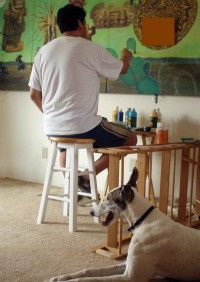 His painting and murals are acquired by businesses and individual collectors in North America, Europe, and Australia and Japan. Cristiana Marinescu, Painter and artist therapist. 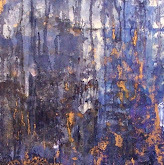 She started experimenting with art at the age of 4, and continued with formal training in Architectural Design, acquired a degree from The School of Visual Arts, NYC, a Certificate in Art Therapy from New School for Social Research, NYC, Certification form Belleruth Naparstek in Guided Imagery Healing and studied the Healing Visualization technique of Gerald Epstain MD. She had lead contemplation groups and spiritual study groups for 15 years, and successful art college classes, workshops, and retreats. Cristiana led classes and workshops in the Midwest, The Pacific North West and South West of US. Cristiana developed her skills in many styles and medias and her paintings are in private collections all over the world. 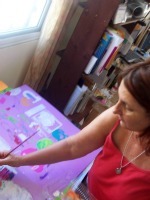 Cristiana is passionate about sharing with you her painting experience and 20 years of teaching. "It is incredibly gratifying to me to see the light of joy on the faces of a workshop participants as their confidence increases! ".